For thousands of HG survivors and a modest but committed advocacy and research community, a profound opportunity for raising awareness had at last arrived. Yet, a stampede toward competitive edge with one of 2012’s hottest stories created a hysterical media moment. Journalism’s fundamental due diligence took a back seat as coverage perpetuated misinformation and stigma, revealing holes in the competency of popular, mainstream media to report on health and medicine. The hurried official statement from Prince William’s office on the morning of December 3rd did little to set up insightful, accurate reporting, defining hyperemesis gravidarum as “very acute morning sickness.” This wording – imprecise and understated – likely reflected the limited vocabulary of even many medical professionals attempting to characterize a bewildering, poorly understood condition. But as the newly-emerging science, a Google search, and an interview with any HG mother will tell you, hyperemesis gravidarum bears little resemblance to normal pregnancy symptoms. (Since his wife’s hospitalization, Prince William has gone on record noting that rather than morning sickness, “it’s all day and all night sickness.”) In fact, hyperemesis gravidarum is a worldwide women’s health problem, particularly threatening to mothers without immediate access to medical care, including low-income women and those in developing nations. It robs pregnant women of what should be a joyful time. Many are haunted by the ramifications for their health, emotional wellbeing, work, and relationships long after giving birth. Some lose their lives. Yet, with the Duchess of Cambridge story, the initial misnomer stuck – substituting for journalistic inquiry and expert sources – resulting in coverage that undermined the HG community’s hopes and the health literacy of us all. During the initial feeding frenzy, too many outlets took one low road or another. Snark-infested Gawker predictably reported that “Kate was admitted to the hospital today with ‘hyperemesis gravidarum,’ which is what they call regular old morning sickness when you are a princess.” But they weren’t alone. Led by a glib Barbara Walters, reporting live as she read the palace statement from her Blackberry, the women of "The View" openly mocked the condition they couldn’t pronounce and cut off a nurse in the audience who attempted to respond to Walters’ less-than-earnest inquiry into HG’s seriousness. (To date, producers have ignored a deluge of negative feedback on The View’s message boards from HG women calling for a retraction or a conciliatory educational segment.) Stephen Colbert, who might’ve been expected to mock the media’s insensitivity, instead joined the chorus (starting at 11:00). The venerated ABC News ran a ticker headline, “Kate’s condition not serious.” CNN’s Sanjay Gupta appeared to inadvertently conflate the causes and symptoms of ordinary morning sickness with the more complex condition at hand, while his network unself-consciously reported humorous highlights from Britain’s “media frenzy” surrounding the pregnancy. Days passed and news outlets still struggled to report on the Duchess’s condition with any depth. To their credit, a few – including CBS News and The Katie Couric Show – consulted resources like the HER Foundation. Couric’s segment included the HER Foundation’s Ann Marie King, along with another HG survivor, at last giving a voice to the HG patient community. Yet “keeping it light” remained a rallying cry, with producers and reporters prioritizing entertainment value. Among other failures, most outlets relied upon in-house medical experts not adequately prepared to provide sophisticated reporting on hyperemesis gravidarum. Such was the case when The Katie Couric Show brought in ABC News staff physician Dr. Jennifer Ashton, who never claimed to have treated an HG patient but spoke perkily about the helpfulness of acupressure and ginger (helpful for morning sickness, but widely known by HG veterans to resemble treating a broken bone with a band-aid). Couric kept the Kate story “positive” and “fun,” which led to speculation about HG and twins, unhampered by the theory’s insufficient evidence base. And as HG-survivor moms shared stories of feeding tubes, hospitalizations and liver damage, Couric deftly steered Dr. Ashton’s interview away from deeper discussion of serious health implications, setting an autopilot course toward feel-good and tone-deaf. At the time of this publication, small glimmers of substantive reporting are just beginning to emerge. Breakthroughs have come from specialized niche media, including a Scientific American story with Dr. Marlena Fejzo, a geneticist at UCLA’s Geffen School of Medicine working to identify the genes responsible for hyperemesis gravidarum’s most severe cases. And bloggers have triumphed on their own terms, seizing the moment to increase public understanding with a grassroots approach mixing personal accounts and emerging science. But these exceptions – and their exceptionality – expose the need for mainstream outlets to reconsider how they approach breaking medical stories specifically, and health literacy generally. 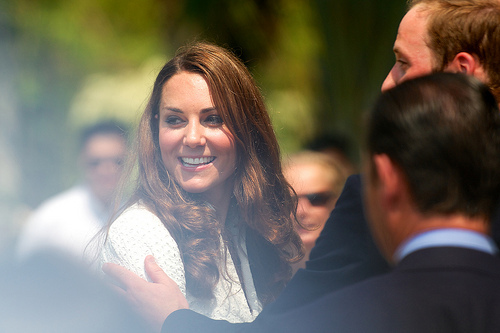 While Kate Middleton’s pregnancy is new, and the severity and duration of her HG remains unknown, those who best understand hyperemesis agree: The gravitas of celebrity has opened the door, and progress is within reach. This is the best article I have ever read about what HG survivors suffer with, and how hurtful the stigmas are about "it's just morning sickness". It's not. And it's not funny. I haven't watched The View since, and I was furious over Colbert's mockery of her situation. Thank you. I've had hg with all 5 pregnancies. It is a serious and life threatening condition for mom and baby. Thank you. The most sense I've seen so far regarding Kate Middleton's diagnoses and the reporting there of. As an HG sufferer I have been frustrated and offended by all reporting so far. Katie Curic came close to sensible, but this piece is by far the best. Thank you. Hopefully, now, people will quit considering Barbara Walters an authority on ALL subjects. She, obviously, still has a lot to learn and should admit this. My grand-niece suffered through two pregnancies with hyperemesis gravitas and, thank God, has two beautiful daughters. If more people understood this malady, others might not have to go through what she endured. Thank you for this article. You perfectly articulated everything I have been feeling. Thank you for this article. Its very nicely written and factual. Hopefully this will help bring more light to the HG community. Thank you for this great article! I currently have a petition going in the hopes that the ladies of The View/ABC will apologize. As we all know, it is never too late for an apology!! This is a great article, and is just what all of us HG sufferers and survivors wanted to read about! We are so sick of hearing that it's not a big deal and that "it's just morning sickness". I was almost happy to see that a celebrity finally had it so that it would catch some media coverage, but it has only become a joke instead of a real issue taken seriously. Thank you! Thank you so much, We HG Survivors want nothing more but accuracy reported regarding this condition. We have been yelling screaming and begging for years for this condition to be understood. This article hit what all of us are thinking on the head. We just pray that since this has now come out in mainstream media that funding for the much needed research will come through. We are all very aware of Dr. Marlena Fejzo's studies and we hope that more woman who are suffering and their family members and friends (as well as the general public) will go to the HER Foundation website and donate to this cause. We are tired of waiting for a cure. We just want to be well and actually be able to enjoy the joy of pregnancy like other women are able. Please! Every little but helps! As a survivor of severe HG. Thank you for being open and honest about this condition and the fact that my pregnancy will always be the most horrific part of my life. I can't write about HG without breaking down as memories assault me, so I will leave it at this. Thank you for this round-up! It tracks the evolution of the media coverage so well. I noticed an error -- the author of the article at The Frisky is Evan Derkacz (not Ethan). Hi Janice. I'm just now seeing your comment on Thursday night, but the error with Evan's name was corrected a couple of days ago. Thanks! Thank you for putting some decent information out there. As a two-time HG survivor, I am FURIOUS that the media are not only misrepresenting this condition, but actually making fun of it. I challenge any of those individuals to live through just one day of HG. I absolutely suffered through my pregnancies and feel a flood of emotions when I try to talk about how bad it was. Like others who have commented here, I was hoping that Kate's situation would bring some overdue attention to this condition so people would understand. Doesn't look like it. I love what you are trying to do here and I agree wholeheartedly. I am concerned though that you talk of journalistic integrity, yet claim as fact that the nurse committed suicide. In fact, we do not know this for sure. They have not released the details of her autopsy and inquiry yet. Although, it may seem a given, you may be left feeling pretty silly if she had a heart attack or a brain aneurism. Yes, great article. I appreciated the acknowledgement of the long-term ramifications - 20 years later I still see the damage that two HG pregnancies did to my marriage and still worry if my inability to eat was responsible for my daughters' health problems. I do feel that Kate undermined the severity of the condition by leaving the hospital looking so glam. The smell of any hair or makeup products would have had me in retching convulsions. I couldn't agree more with this article. I didn't see the the view or hear the comments of Barbara Walters but did feel that Katie Couric just briefly described what HG is all about. Its really scary when you are the actually one having these symptoms. I had to have a blood transfusion my fourth month of being pregnant and had to have a central line put in my neck which only lasts four months. At the time my Dr. was not very understanding and this being my first child I really didn't understand the severity of this situation. When I finally went In for the fifth time for dehydration and they noticed my hemoglobin was a three the first comment from my Dr. was, "You are like a starving child in Africa" Needless to say the next week I switched to a different doctor. I was also very lucky to have my mom who is an RN so she was able to help me and understand everything that was going on. I ended up switching to a pic line that is more of a permanent IV running into my heart this allowed them to draw blood, put meds into me and feed me through this my nutrition was called TPN, this is made up of vitamins and nutrients for me and my baby. The doctor told me I could try to eat but it wasn't necessary. I was on 18 hour bags so when I was taken off my blood sugar would drop so I would change it to dextrose IV bags. My stomach would burn constantly because of all the bile I was vomiting all day long and my esophagus felt raw and I would sometimes see blood in the toilet from throwing up so much. I couldn't keep even water down. You don't know if your baby is going to be okay or if you are going to be okay. It's hard to do anything at all even to pray. Most days I sat in a dark room staring at the wall even the TV was difficult to watch. I didn't realize how many food commercials play throughout the day! It's was exhausting just watching TV. I would get extreme anxiety and didn't really have energy to walk but made myself walk down the block as far as I could go. I would hold pictures of my ultrasound pictures and constantly repeat to myself I have to stay strong for my baby. I had to take it day by day. They delivered all my meds & TPN weekly and I carried a back pack with a cad pump which is a portable pump that would pump my TPN all day. I had to make sure I wrapped my arm really well when I showered because any bacteria could go straight in to my heart and I could die from it. It also affects the whole family especially the ones caring for you. My mom lost 30 pounds because she felt so bad for me & just couldn't eat. My husband lost 15 pounds & they couldn't eat or have any kind of scent in the house would make me more naucious. I took every nausea med & every home remedy and guess what, they didn't work. Then they think it's psychological but it's not believe me I wanted to eat and be normal. It was upsetting because not a lot of people understand what you are feeling and going through. I did have a healthy baby boy 8lbs 13oz. and next next day I was able to eat and had no nausea. It's sad for anybody to experience this but the blessing you get is so worth it! I had to focus on my son to get through this. I'm so happy that I came across this article and the Facebook page. I'm sad that Kate is experiencing this but glad that know people will start to recognize how serious HG is and it's no joke. I'm relieved to read other peoples stories. I really felt so alone because I had no one that understood it & nobody to relate to so thank you to whoever made this page. Praying for Kate and William also for women suffering with HG that they get through it and stay strong! Thank you for your article! As a HG survivor it's soul destroying to read and hear how HG is portrayed as "severe morning sickness" in the media. I hope and pray every day that more public awareness is increased and encourages because of Kates condition. Finally HG is being discussed and hopefully more money and research will be given to try to deal with this horrendous life threatening condition. The drugs they offer in Australia and worldwide are currently ridiculously expensive and do not work effectively anyway. Hopefully this media frenzy will start to focus on the seriousness of Kates condition and bring more public awareness and hopefully great change to the current medical treatment for all HG sufferers. I am currently 10 wks pregnant with my second child and was diagnosed with HG 1 week before the Dutchess was. I have lost 10 pounds already and have been hospitalized with dehydration. Again, I'm ONLY 10 weeks, it's going to to be a long road. Every day is a struggle especially with a 2 year old to care for at the same time. It is like having the worst stomach virus, food poisoning and a hangover all rolled into one and it never stops. People need to take it very seriously. I had "regular" morning sickness with my 1st pregnancy and that was horrible enough, this is another level of suffering. You are trying to keep yourself alive and this precious baby in your body alive at the same time. God Bless those trying to bring light to this condition. Mom, the condition I spoke of. One of my daughters has had HG. Not until her diagnosis had I heard of HG. But my eight children were all familiar with it. Why? Because my husband nursed me through 8 pregnancies, each with HG. At 68 it is good to have a name for the condition I experienced 8 times over. Any time someone said, "Oh, I know. I had morning sickness and it is horrible," I learned to say nothing. I knew they had no comprehension of what I had or was experiencing, of the difference between the two. I would have been thankful to have had only morning sickness. HG survivors know. Thank you for a most informative and helpful report. Thank you for bringing the truth about HG and the way people mock it. IV had a little girl from a HG pregnacy and am nearly finished my second HG pregnacy with a little boy. Has anyone else found HG pregnacy with a boy a little easier? With my daughter, I was told in the hospital (in Glasgow UK) it was the worst case they had seen, I was in and out of hospital for all of my pregnacy about 2 weeks out of every month and was still vomiting for 2 weeks after having my little girl. She was my first pregnaacy, I hadn't even hear of it untill I was in hospital after 2 weeks of vomiting, my dr didn't have a clue and said I didn't need to go to hospital for vomiting, and refused to send me at that point I couldn't see properly or walk unaided. By the time I got home I couldn't get off the floor and couldn't stop shaking, all I could do was lie on the floor in a lump, my other half said it was like watching someone die, he got me in the car and took me to hospital ignoring what my GP had said. When I got to hospital I had blood sugar leavel of 1, I had a ketones in my urine, I was told if id left it any longer I would have died. No one explained what it was, or how long I had to wait before coming in to hospital, I was given the name but that was it. I was put on a drip with sodum and gulcose in it and it took a further two day untill the found the correct anti sickness to stop me being sick, my hole pregnacy was like that. With my current pregnacy(little boy) iv only been in hospital 8 times, im still vomiting with 2 weeks to go, but its alot easier, I say that but its still horrific. I had never heard of the horrible disease until I had to keep taking my poor baby girl to the ER all the time. It's so hard watching them go through this and all I do is wish I could help or take it away. We literally have tried everything from special diet to prescription medication yet she is 13 weeks and vomits all day and night. On top of it, her hemoglobin is critically low and may need blood transfusions. I am so tired of hearing people who are uneducated about this disease just shrug it off as a woman who is just whining. They would not be able to handle half of what HG mothers go through on a constant basis. I am glad that I found this wonderful foundation as I will be an advocate for those willing to learn more about this disease. I give all of you the utmost respect and I pray that one day soon it will have a cure or at least a treatment to lessen the severity. So, my heart goes out to all you brave wonderful women and mothers.